Tonight is the first rehearsal of Echo Women’s Choir’s Spring concert season: their 20th Anniversary concert. I’m thrilled to be a guest conductor, alongside the wonderful Alan Gasser, while the choir’s other wonderful conductor, Becca Whitla, pursues her Masters research in Cuba. Echo is a community-based choir in Toronto. There are no auditions to particicpate, though you might have to have your name on a waitlist for a little while. If you’re interested in singing, there are probably hundreds of choirs in the city to choose from, many of which do not require auditions. Most choirs have fees to participate, but some, like Echo, offer sliding scale or subsidies. And trust me, there are choirs of every variety around here. From the more traditional Western European material of the Annex Singers to the rock n’ roll performances of newchoir to the more casual pub-friendly choir!choir!choir! to the sound-scape approach of the Element Choir, there’s something for anyone longing to sing with others in a choral kind of setting. Two great resources for finding choirs are the Canary Pages of Wholenote magazine and the directory of Choirs Ontario (but rather annoyingly, the list is sorted alphabetically, so if you’re looking specifically for Toronto, it takes a little while). Don’t rely on these 2 only, however. Lots of singing groups are cropping up that aren’t in either of these (like all the choirs I mentioned above). If you find a choir to sing with, tell me where and what the experience is like. Or maybe I’ll see you tonight at the Echo rehearsal? Saturday,March 26, 2011 7 to 10 p.m. Such an exciting line-up:Ken Whiteley, David Anderson, Michael St George, Njacko Backo, Marylyn Peringer, Chris Rawlings, and the Cuban Percussion Ensemble. And of course, Echo Women’s Choir (the wonderful choir that I serve as a guest conductor this season). Come join us! Silent Auction plus Nibbles and Cash bar. I just got back from my first rehearsal of the season with Echo Women’s Choir. I’ve sung with Echo for many years. I love the world music and community-minded, loving atmosphere. 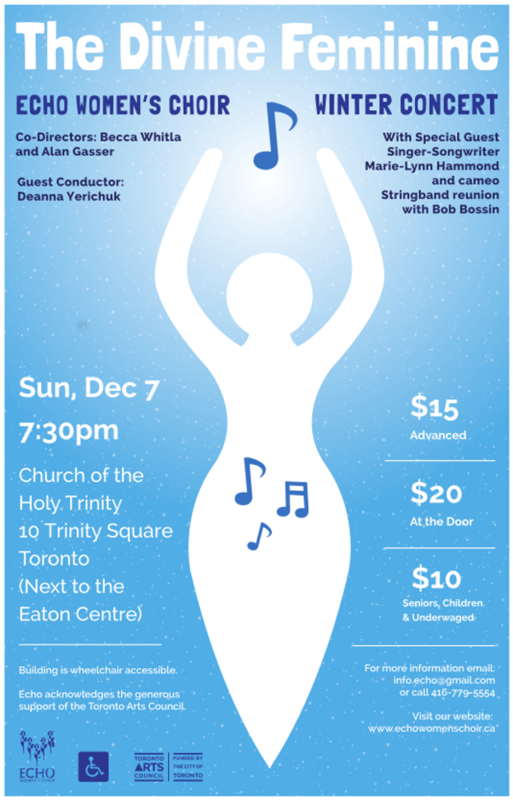 Plus, it’s really amazing to sing with 80 other women in the incredibly resonant Holy Trinity Church in downtown Toronto (yes, this is the same Church of the Trinity Session by the Cowboy Junkies!). I haven’t been able to sing with Echo for the last year because of school, so it feels even more lovely to be back. Like reuniting with an old, dear friend. But this year is a little different. Becca Whitla and Alan Gasser, the choir’s co-directors, are taking a hiatus come January to study conducting in Cuba. They’ve asked me to lead the choir for the Spring session. Yep. I’m conducting an 80-voice choir for 2011. Are you surprised at this turn of events? I am, a little. Oh, I have some conducting experience, and I’ve worked with many groups as a song leader, but this, I’ll admit, is pushing my experience and ability to a whole new level. I’ve considered myself more of a singer and voice teacher than a conductor. But the series of events that led to this opportunity unfolded like the stars aligning. And so this opportunity is here for me now. I am totally scared and excited. That seems like the right place to be. At the rehearsal tonight, I was warmly greeted by many choir members, who all seemed excited at the news of my role in the new year. It’s reassuring to have their faith. And I’ll be conducting a few of the pieces for the Winter concert in addition to singing with the sopranos. Sort of an apprenticeship. So hopefully that’ll ease me in. Get the choir and me a little bit used to each other. Looks like it’s going to be a big year. oh, yes, and the spring concert is on the theme of work. The concert’s on May Day. So if you have any suggestions for songs about working, particularly for women and work, let me know.